"To me photography is a means, perhaps the best means of our age - of widening knowledge of our world. Photography is a method of education, for acquainting people of all ages and conditions with the truth about life today." "I like this picture so well because it re-creates for me some of the feeling I got from the original scene - and that is the real test of any picture." "Half the fun of photography is fooling around, mixing solutions, playing with papers, exercising tangible authority over silent partners of photography - film, paper, chemicals." "Unless you see the subject first, you won't be able to force the camera...to see the picture for you. But if you have seen the picture with your flexible human vision, then you will be on the road to creating with the camera a vision equivalent to your own." "By going to France I found myself and my own country - I just sort of thank God for France - vive la France!" "The minute I touched New York, I had a burning desire to photograph this city of incredible contrasts, the city of stone needles and skyscrapers, the city that is never the same, but always changing - New York." "When I saw New York again, and stood in the dirty slush, I felt that here was the thing I had been wanting to do all my life." "I try to photograph the city without sentimentality or illusions. I want to show its contrasts and contradictions." Bernice Abbott was born in Springfield, Ohio into a troubled lower middle-class family. She was the youngest of four children. When her parents broke up in 1900, Abbott was separated from her three older siblings. She was raised like an only child from age two until age twelve, when both sides of her family resettled in Cleveland, Ohio. Even then she hardly saw her father, who was a cement salesman in Cleveland. He provided neither guidance nor understanding. From a young age Abbot demonstrated an independent streak and described herself as a "softy who got pretty hard early." She defied her mother's wishes to marry or to become a teacher. Instead, after high school, Abbott enrolled into Ohio State University (OSU) in Columbus to study journalism. She was an avid reader, who enjoyed engaging with new ideas, and soon fell in with a circle of older students with modernist ideas and leftist politics. After freshman year, Abbott had become estranged from her family and restless. She accepted an invitation from her older OSU friends in New York to come to Greenwich Village. Abbott moved to New York in January 1918 in search of new opportunities, abandoning her studies in journalism. She survived the Spanish influenza pandemic in 1919, and then took on temporary jobs while she taught herself sculpture. Abbott was welcomed in New York by the most influential avant-garde artists and writers of the time, who encouraged her artistic studies. Her bohemian circle included the writers Eugene O'Neill and Djuna Barnes, the artists Man Ray and Marcel Duchamp, Baroness von Freytag-Loringhoven, and the Little Review editors Margaret Anderson and Jan Heap, among others. As Abbott's biographer Julia van Haaften points out, "To her, they were just "buddies." Desirous to leave conventional America behind and keen on participating in the new and creative energies unfolding in Paris, Abbott sailed for France in March 1921 and settled in Paris. Arriving with little French and few prospects, she supported herself with odd jobs. 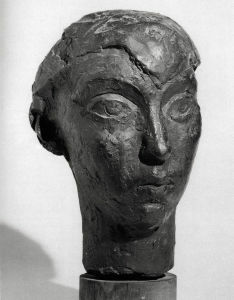 Bernice soon adopted the French version of her name "Berenice" and set about meeting artists and writers, such as Nina Hamnett, Ossip Zadkine, and Constantin Brâncuși, who encouraged her studies of sculpture. Berenice connected with English and American ex-patriates as well, among them was the art patron Peggy Guggenheim. 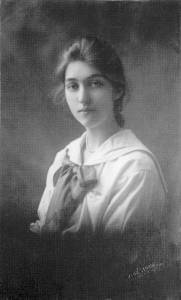 Her old friend Baroness Elsa introduced to her to André Gide and his circle. 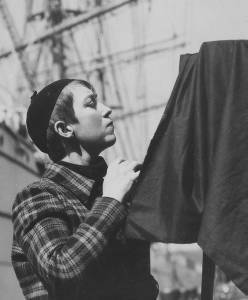 This proved a significant period in her life as she began to more openly define herself as a lesbian through her relationships with such society figures as Princess Eugènie Murat and the artist Thelma Wood. Over two years Abbott traveled between Paris and Berlin to complete her studies in sculpture. It was also helpful that the dollar stretched further in Berlin than it did in Paris due to Germany's hyperinflation. In 1923, after a short stay in Berlin, she fortunately encountered Man Ray, her old friend from New York, who would introduce her to her future vocation of photography. Abbott ran into Man Ray by chance on the street in Paris. During their conversation, Man Ray explained he was looking for a darkroom assistant, who knew nothing about photography, so he could train the person to print in accordance with his own method. He hired Abbott immediately for minimum wage and doubled her wage, when she proved a quick learner and proficient at darkroom work. Abbott credited her study of sculpture and drawing, as helping her to see the plasticity of the image in the developer. Man Ray introduced Abbott not only to the photographic practice and the running of a portrait studio, he shared with her his fascination for Eugène Atget's photographs in 1925. Man Ray even took Abbott along the next time he visited Atget. Abbott became familiar with the legendary photographer's numerous prints and negatives over the course of her various visits to his studio. She was drawn to his realist photographs of Paris and its environs. His straight documentary style influenced her own approach to photographing New York City and the American scene in the Midwest and on the East coast. The impact of Atget's photographs on Abbott was immediate: "There was a sudden flash of recognition - the shock of realism unadorned." Notably Atget never intruded between subject and observer or manipulated his photographs. Abbott eventually created in Atget, according to the photo-historian Terri Weissman, "her own symbolic father, the father of photographic realism." While working for Man Ray between 1923 and 1926, Abbott discovered both an affinity and passion for the medium. Eventually Man Ray showed Abbott how to operate his camera and even offered her to use his studio, so she could photograph her own portrait clients during her lunch time. She even took portraits of Man Ray's clients to assist him in his business. Unfortunately unintended competition developed between Man Ray and Abbott. The rift between Abbott and Man Ray was further exacerbated when Peggy Guggenheim requested to have her portrait taken by Abbott rather than Man Ray. Yet, to be photographed by either Abbott or Man Ray in the 1920s "meant you rated as somebody." Abbott soon left to set up her own Paris studio in 1926 with financial assistance from Peggy Guggenheim. By then, she had amassed a portfolio of notable sitters, including the poet Jean Cocteau, the novelist James Joyce, Gide, Marie Laurencin, Sylvia Beach, and gallerist Betty Parsons. Abbott's portraits were regularly published in the magazines The Little Review, Vogue, and Vu, as well as even displayed in a solo exhibition at the gallery Au Sacre du Printemps in June 1926. Through this exhibition Abbott came in contact with the art critic Georges Charensol, who promoted modern photography and in 1928 was a member of the jury for the Premier Salon Independent de la Photographie, also known as the Salon de l'Escalier (Staircase Exhibition). This exhibition strove to position the work of modern photographers within a tradition with reference to Nadar and Atget. Abbott not only exhibited her work in this salon, she loaned a number of Atget's photographs for the exhibition. At the time of the Salon de l'Escalier, Abbott was negotiating to purchase Atget's commercial stock of photographs from André Calmettes, a longtime friend of Atget (who by then had passed away). Abbott purchased Atget's archive in 1928 and continued to promote Atget's work. She sent prints of his photographs along with her own works to various modernist exhibitions. 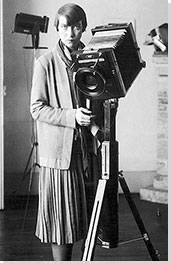 Abbott participated in 1929 in the pioneering modern German photo-exhibition Film and Foto, which included twelve portraits by Abbott and the same number of photographs by Atget. In January 1929, Abbott left for New York, where she opened a portrait studio, took part in modernist photography exhibitions, published her photographs, and continued to promote the genius of Atget. The following year Abbott and the gallerist Julien Levy, whom she had met through Man Ray in Paris, signed a contract for the management of the Atget Collection. Abbott agreed to keep Atget's archive intact, while Levy assisted in commercially using and exploiting Atget's photographs in publications. Both gallerist and photographer hoped to boost their reputations and make a good sum of money. Once in New York, she found herself utterly inspired by the city, which had been transformed by the construction of skyscrapers and infrastructure for rapid transportation and communication. Abbott resolved to photograph the city's fast tempo and contrasts of old and new. While her fashionable studio work provided income and critical success, she worked on documenting New York. She believed her status as a newly returned expatriate extended her special insight into the city. Berenice Abbott photographing on the streets of New York City (1937). Photo by Consuelo Kanaga. Having sold a half interest in her Atget collection to Julien Levy in 1930, Abbott was able to buy a large format camera that became her standard equipment for documenting New York. As Abbott struggled to further her project, she found that the Depression had strained potential sources for funding, such as the Guggenheim Foundation, New York Historical Society, and even wealthy individuals. The government was compelled to provide unemployment relief for all workers, during the economic crisis. One such government agency was the Federal Art Project (FAP), a division of the Works Progress Administration, which embraced the creative arts and photography. In fall 1935 the FAP granted four years of funding for Abbott's project Changing New York. Throughout the project the photographs were exhibited in New York and elsewhere. A selection from Abbott's 305 photographs appeared as a book with 97 illustrations and text by art critic Elizabeth McCausland shortly before the opening of the New York World's Fair on April 30, 1939. In late 1934 the Museum of the City of New York hosted Abbott's first solo museum exhibition, which garnered much critical acclaim, particularly from the newspaper critic Elizabeth McCausland. McCausland would eventually assist Abbott on her Changing New York project by managing the supporting research and writing descriptions for many of the images. Around this time, McCausland became Abbott's romantic partner until her death in 1965. They helped each other professionally and McCausland would push Abbott to develop a pictorial framework, based on her own ideas of the usable past. Their shared passion for America led to their monthlong excursion in summer 1935 through the upper South and parts of the Midwest. It was on this trip that Abbott and McCausland began to plan their photo book portrait of the nation. Abbott's photographs captured the distress caused by the Depression rather than a story of hardship and heroism, associated with the documentary photographic projects funded by the Farm Security Administration (FSA). Yet like her friend Walker Evans, Abbott recorded both the built and/or social space to capture the material expression of culture. As the photo-historian Terri Weisman explains, Abbott was interested in "how the things in the world reveal the world." However, Abbott's and McCausland's photo book project never came to fruition. Abbott accepted the opportunity to teach photography at the New School for Social Research in 1934 until 1958. Teaching helped her to write accessibly about the methods and philosophy of photography, which were so central to her work. In 1941 Abbott penned A Guide to Better Photography in which she voiced her commitment to Straight Photography and realism as a communicative interaction with an audience. As early as 1939, Abbott turned her attention to science, because, as she explained in a letter to her friend Charles C. Adam, "we live in a world made by science, but we - the millions of laymen - do not understand or appreciate the knowledge which thus controls daily life." To gain access to the scientific world, Abbott regularly attended scientific meetings. She sought to find parties interested in her projects. Abbott's persistence led her to Gerald Wendt, a science writer for Time magazine. In 1944 Wendt became the editor for Science Illustrated and hired Abbott to be the journal's photography editor. Her pursuit of scientific photography, however, did not end there. Abbott had been inventing photography machines, for instance one allowed her to enlarge prints and attain higher levels of clarity. Having learned of the Physical Science Study Committee (PSSC) at the Massachusetts Institute of Technology (MIT), she contacted its executive director Dr. Elbert P. Little, who hired her immediately. The PSSC engaged Abbott to assist in making science appealing to high school students through new science textbooks. These new subjects inspired Abbott to invent more machines, such as a darkroom distorter, a picture composer, thumb camera, and Hi-Shot Shoulder-Pod. In many ways, her science images came closest to her realist vision, as they established a connection between the expert culture of science and the lay public. Despite Abbott's successes as a modern photographer, her life was not without controversy. During the McCarthy era (from late 1940s to the early 1950s), the FBI in 1951 labeled Abbott a "concealed Communist" due to her association with the Photo League. While her name was deleted from the list four years later, she remained afraid of the government's intrusion and the wire-tapping of her phone. Abbott spent the last decades of her life in Maine, where she had bought a home and settled permanently, after having visited the state in 1954. Abbott liked the quiet of the country after so many years in New York City. She photographed the state and published her photographs in 1968 in the book A Portrait of Maine. To combat potential loneliness, Abbott adopted a kitten she named Butch. Her eccentric qualities made an impression on the people in the small town where she lived in part, according to author Julia Van Haaften, because she was one of the few residents who was a Democrat. 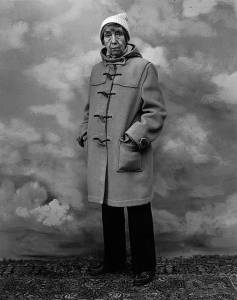 Berenice Abbott in New York City on November 18, 1979. Photograph by Hank O'Neal. Abbott's health declined in her later years. Yet, her sale of Atget's archive to the Museum of Modern Art in 1968 and the increasing sales of her own work provided her with financial security. Something she did not have for most of her life. Having lived through the Depression, Abbott had become distrustful of financial institutions and she was known to keep her money in a home safe and hidden in boxes. This proved disastrous for Abbott who lost the majority of her wealth, much of it in gold and coins, when her house was burglarized in 1984. Succumbing to respiratory illness that had plagued her since childhood, she died of bronchiectasis at the age of ninety-three. Berenice Abbott contributed to modern photography's recognition as an art form in both Europe and America. Her photographic practice demonstrated the medium's complexity through her direct approach toward her subject matter and how photography could be used as both realist document and modern photographic art. In this way, Abbott served as a forerunner for future generations of photographers and contemporary artists who continue to push the boundaries of the medium, such as Gregory Crewdson, Wolfgang Tillmans, Trevor Paglen, Jeff Wall, Clare Strand, and Gillian Wearing. Her legacy continues through a photography award that is given to emerging photographers with a body of work waiting to be published. In this portrait, Eugène Atget, with a bemused expression on his face, stares out at the camera. The elderly French photographer presents himself formally dressed in a suit and tie under a thick dark overcoat and in his right hand, which rests on his thigh, he holds a pair of glasses. Yet, the personal interaction between Abbott and Atget is the actual subject of this portrait, partially revealed in Atget's facial expression.